Last date for online submission of application form on 17-06-2017. Number of posts for Staff Nurse- 460. Gen-231, SC-69, ST-35, OBC-125. Registered as Nurse or Nurse and Midwife with State Nursing Council. Two and half years experience in minimum fifty bedded hospital after acquiring the educational qualification. 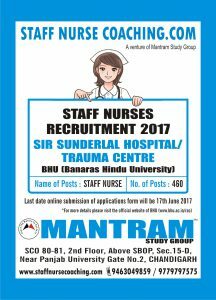 SPECIALIZED COACHING FOR STAFF NURSE RECRUITMENT SIR SUNDERLAL HOSPITAL/TRAUMA CENTRE, VARANASI. The Coaching for above mention course is starting from 5th June 2017. Therefore students who are interested for Staff Nurse Recruitment Caching may kindly register before 5th June 2017.The registration fees is Rs.1000/-and it is not refundable.